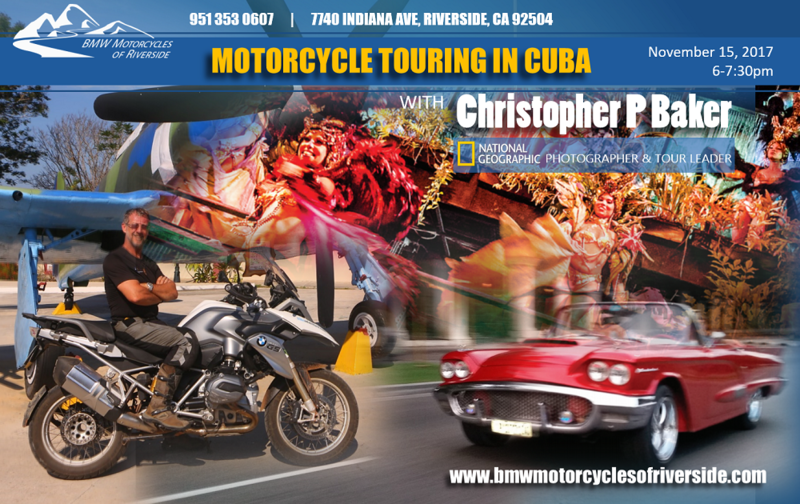 Come hear motojournalist, National Geographic photographer and tour leader, and Cuba expert Christopher P. Baker speak about ‘Motorcycle Touring in Cuba’ at BMW Motorcycles of Riverside, November 15, 2017 (6-7:30pm). Chris will regale stories of his three-month, 7,000-mile journey through Cuba in 1996 when, as a journalist, he shipped his BMW R100GS to Havana to research the Moon Cuba guidebook. His journey also resulted in publication of a literary travelog, Mi Moto Fidel: Motorcycling Through Castro’s Cuba (National Geographic Adventure Press). Ever since that journey, he had a dream of leading group motorcycle tours of Cuba for U.S. citizens. Chris made that a reality in 2012 when he secured a license from the U.S. Treasury Department to operate ‘people-to-people’ programs in Cuba. Chris will explain about the 8- to 14-day motorcycle tours in Cuba that he will lead for Edelweiss Bike Travel in 2018 and beyond.